Using your Pop-Up Camper is fun. Maintaining it? Not so much. Let an ADCO RV cover do the heavy-lifting by keeping the daily environmental abuse to a minimum and decreasing the build-up of dirt and debris. You’ll be amazed at the difference in the appearance of your unit. If you’ve never had a cover before, you’ll wonder why you waited so long to get one. 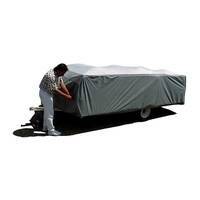 We stock Folding Trailer covers and Pop-Up Camper covers ranging up to 18 feet in length. So if your pop up camper is a Fleetwood, a Jayco or somethining else, we have you covered. We'll ship your cover the same day that you place your order, so you don’t have to wait. Questions? Call us, we’re always happy to help.